Posted on February 26, 2018 at 5:31 am. We begin today with a special announcement from our Student Services Staff about the importance of planning for college — even NOW when you’re still in Middle School. Please welcome our 7th grade counselor to the set — it’s Mr. Caldwell! CALDWELL: Hello, Wolves! I’m Mr. Caldwell, and on behalf of the entire Student Services Staff, I’m here to encourage you to jump on the “March Madness Bandwagon” — and get PUMPED about COLLEGE!! That’s right — all this month, we’re promoting College Awareness at WMS through a series of activities, trivia, and special events. Here’s the rundown: Every Monday, we’ll have fun facts on the Morning Announcements about colleges across the country. Then on Friday, March 23rd, we’ll be testing your “college knowledge” with a pair of trivia questions for YOU to answer. Plus — we’ve GOT to have a DRESS-UP DAY! On Wednesday, March 21st, it’s College T-Shirt and Sweatshirt Day, when students and staff will get to strut their stuff in their favorite college gear. And finally, let’s have a “college competition!” Find out your TA teacher’s alma mater — that means what college they went to — then decorate your TA door with their college colors, the mascot, and at least 10 fun facts about the school. The Student Services Staff will then tour the school in 3-week’s time, select the best college booster from each grade — and award Wolf Paws to the entire TA!! So now, let’s kick things off with our first fun fact! Did you know that the biggest universities in America boast TENS of THOUSANDS of students? Each one is literally the size of a small city, or a large town!! 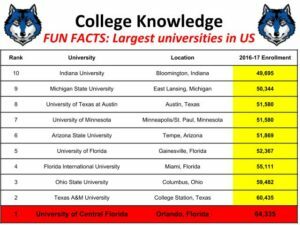 In fact, the BIGGEST of the BIG is the University of Central Florida — located in Orlando — with more than 64-THOUSAND students. And the top-10 largest universities each average over 54-THOUSAND people. That’s a LOT of education. This was just the start of College Awareness Month at WMS. So start decorating your TA doors, get geared-up, and let’s GET PUMPED ABOUT COLLEGE!! Thanks for all that great college knowledge, Mr. Caldwell. And we hope that all you Wolves have fun during College Awareness Month at WMS!! The Boys Cohort will be meeting TODAY during ASP 1 in room 233. It’s an opportunity for Black and Latino students to meet new people, and become LEADERS in our community. Allies are welcome, too! There will be a guest speaker next week, so don’t be late! See Mr. Hicks, Mr. Eason or Mr. Valdez with any questions. On your marks, get set, GO!! Are you ready to help the WMS Track and Field Team defend their County Championship this year? Interested athletes are invited to an informational meeting on TUESDAY during ASP 1 in the gym. You’ll get to meet the coaches, ask questions, and learn everything you know to know about the upcoming Track and Field season — which begins on March 12th. Just sign-up using the QR code outside of the cafeteria, or see Coach Treble with any questions. The National Museum of African American History and Culture opened to RAVE REVIEWS last year — and now YOU can see it for yourself! WMS is organizing a field trip to the African American Museum on March 9th. It’s open to all students — but space is limited, so it’s first-come, first-served. Just get a permission slip from the main office and return it by TOMORROW. See Ms. Cameron or Ms. Mays with any questions. Don’t miss out of this amazing opportunity! !